Being an actress was never part of her plan. Yet Jasmine Sim, 24, completed filming her third Channel 8 drama, When Duty Calls, last month. The 20-episode TV series, which will premiere at the end of next month, sees Sim play air force engineer Chen Yi Yun. The drama also stars Zheng Geping, Romeo Tan and Felicia Chin. Sim, who was The New Paper New Face 2014 first runner-up, said she has been quite "lucky" with her acting journey. "For a newcomer, it is not as easy to get these roles. But my acting agency, Ahundred Ants Production, was able to land the casting calls for me," she said. Sim's part in When Duty Calls is a "heavier role" compared to her previous stints in Channel 8 dramas Dream Coder and The Lead. She is also represented by NOW Model Management, after participating in the New Face pageant. "It was through New Face that I met my current agencies and managed to expand my career. Taking part in New Face opened new doors for me," Sim said. In Dream Coder, she acted alongside New Face 2011 finalist Jayley Woo. Said Sim: "It was comfortable working with Jayley, as she is a young actress as well. I did not really know anyone, and she was friendly to me." She added she did not know that Woo had also taken part in New Face until after Dream Coder ended. Prior to New Face, Sim modelled for local fashion brand Love, Bonito's online store. But when acting jobs came along last September, modelling took a backseat. Now, she is taking a month's break from acting. She will be focusing on modelling gigs, such as a short promotional film for Raffles Hotel. On future acting and modelling prospects, Sim said: "I see myself as someone who takes things as they come. "I want to be doing these professions for as long as I can." New Face alumni Abby Som and Vanessa Ho walked down the pageant's runway in 2014 and 2015 respectively. Later this month, both will be walking the international stage at the Asia Model Festival in South Korea. The Beam Artistes artists - who both won modelling competition Face of Singapore last month - will represent Singapore in the Face of Asia finals, which will be held during the Asia Model Festival. Miss Ho, 18, said: "This will be the first time I am gaining exposure overseas, so I hope I will gain from the experience and get to improve my runway walk much more." Miss Som, 22, said she hopes the festival will boost her entry to the modelling markets outside Singapore. Both agreed that their participation in New Face opened up new platforms for them. Miss Som said: "New Face was a good stepping stone for further modelling opportunities." She added that several modelling agencies had contacted her due to the exposure she received from the pageant. Miss Ho, who wants to be in the media industry for the long run, also benefited from it. She said: "New Face gave me the first taste of modelling and the media, and I do not want to stop." Wear a fitted top with a miniskirt or shorts, high heels and light make-up. Bring a close-up photo of yourself for submission. 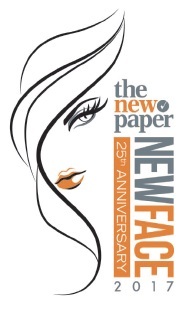 Register at tnp.sg/tnpnewface by June 14. Selected contestants will advance to Round 2.